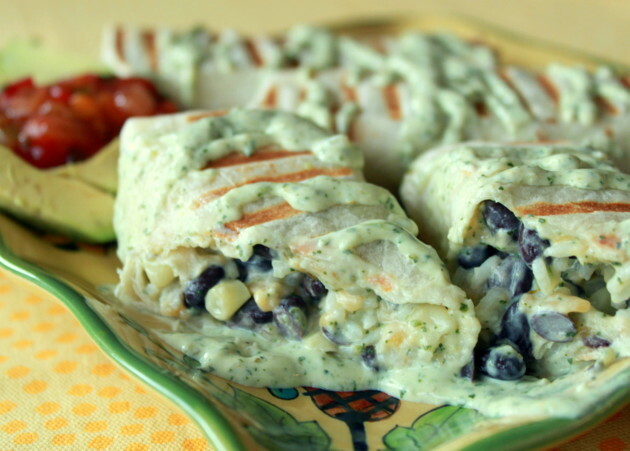 These panini-press-grilled burritos boast a slightly crispy exterior with a melty-hot inside featuring black beans, corn, rice, optional chicken, and Creamy Cilantro-Jalapeno sauce. 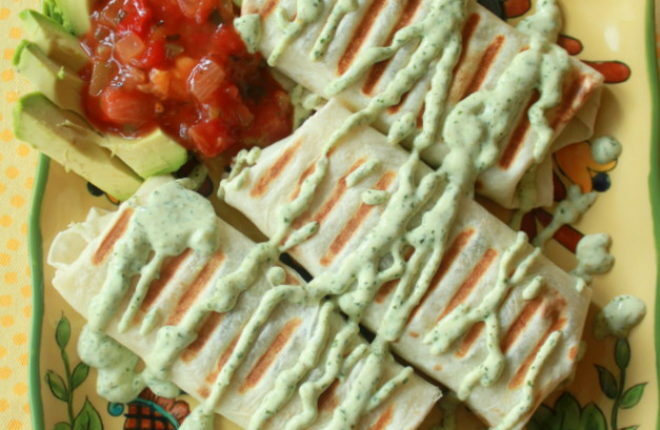 Still looking for the perfect Cinco de Mayo dinner? Look no further. 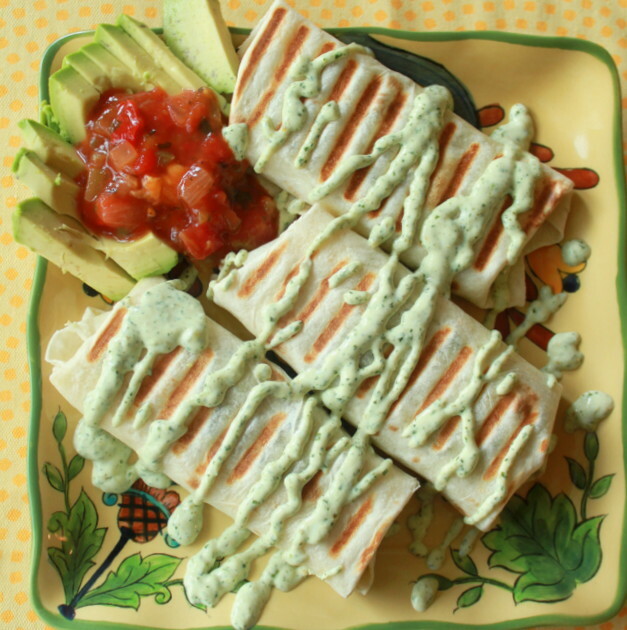 These grilled burritos make an easy, delicious, and festive meal – especially when served alongside some icy fresh lime margaritas. These burritos as much about a new-to-me method than an exact recipe. Prep a hearty filling, roll it inside a tortilla, and grill the burrito for a few minutes in your panini press. Delicious. Though I’ve got to say I’m going to find it hard to vary from this combo of black beans, corn, rice, chicken (if you want), and scrumptious cilantro-jalapeno sauce. Mmmm. 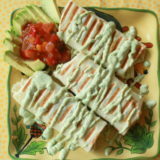 The cilantro-jalapeno sauce. I love this stuff. Made with light sour cream (less guilt! ), lots of cilantro (tons of flavor! ), pickled jalapeno (kick!) and lime zest (I don’t know what else to say here!) – it brings this burrito to soaring new heights. Try these today in honor of the holiday, or any other day in honor of eating deliciously. Make the Creamy Cilantro-Jalapeno Sauce. Place all ingredients in a blender or food processor and blend until pureed. Cover and chill for at least 30 minutes, or up to two days. In a medium bowl, add the chicken (if using), beans, corn, rice, cheese, and cilantro-jalapeno sauce. Gently stir with a fork. Season to taste with salt and pepper. Lay out flour tortillas and divide mixture between them. Place the mixture on on the bottom half of the tortilla, fold the sides in, then roll up the tortilla. Grill on the panini press per your press's instructions (I cook two at a time and it takes about four minutes per batch). 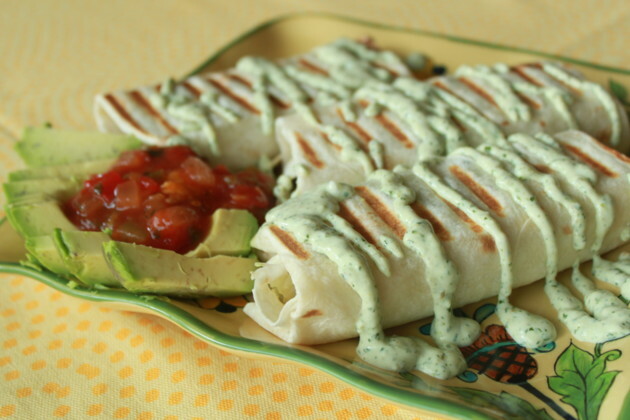 Serve drizzled with additional Creamy Cilantro-Jalapeno sauce, salsa, avocado, and any other condiments you desire.